A collaborative research project aimed at designing better tools and practices for learning web development. We're creating tools aimed at helping beginners learn web development. Snowball is a WordPress plugin that allows journalists and others to build immersive, interactive articles that feel right at home on the web. Snowball is designed to bridge the gap between graphical and code editors. 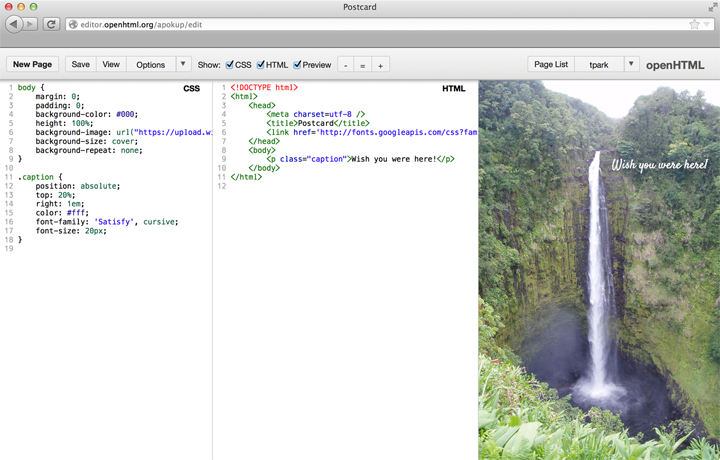 openHTML Editor is a web editor that allows beginners to jump into coding HTML and CSS. Learning features include W3C validation, a coding session replayer, and group management features for classes and workshops. Nester is a suite of instruments for evaluating general coding skills and knowledge. We're also conducting design and research that contribute to Mozilla Thimble and Webmaker. We're also conducting research on how people learn web development. Drawing from the computing education research literature, we've studied web development novices in the lab, in workshops, and online. A few of our papers are listed here. This work is supported by the National Science Foundation through grant CNS-1339344. Kim, Meen Chul, Thomas Park, Ruixue Lu, and Andrea Forte (2019). Understanding Learning Curves and Trajectories in CSS Layout. Proceedings of the ACM Special Interest Group on Computer Science Education (SIGCSE). Minneapolis, MN. pp504-510. Park, Thomas, Meen Chul Kim, Sukrit Chhabra, Brian Lee, and Andrea Forte (2016). Reading Hierarchies in Code: Assessment of a Basic Computational Skill. Proceedings of the ACM SIGCSE Conference on Innovation and Technology in Computer Science Education (ITiCSE). Arequipa, Peru. pp.302-307. Kim, Meen Chul, Thomas Park, Brian Lee, Sukrit Chhabra, and Andrea Forte (2016). A Constructionist Toolkit for Learning Elementary Web Development at Scale. Proceedings of the ACM Annual Conference on Learning at Scale (L@S). Edinburgh, United Kingdom. pp.89-92. Muibi, Hauwa, Brian Dorn, and Thomas Park (2015). Teacher Perspectives on Web Design Instruction. Proceedings of the ACM SIGCSE Conference on Innovation and Technology in Computer Science Education (ITiCSE). Vilnius, Lithuania. pp.231-236. Park, Thomas, Brian Dorn, and Andrea Forte (2015). An Analysis of HTML and CSS Syntax Errors in a Web Development Course. ACM Transactions on Computing Education (TOCE), 15(1), pp.4:1-4:21. Park, Thomas, Swathi Jagannath, Ankur Saxena, Susan Wiedenbeck and Andrea Forte (2013). openHTML: Designing a Transitional Web Editor for Novices. ACM Conference on Human Factors in Computing Systems (CHI) Extended Abstracts. Paris, France. pp.1863-1868. Park, Thomas, Ankur Saxena, Swathi Jagannath, Susan Wiedenbeck, and Andrea Forte (2013). Towards a Taxonomy of Errors in HTML and CSS. Proceedings of the International Computing Education Research Conference (ICER). San Diego, CA. pp.75-82. Park, Thomas and Susan Wiedenbeck (2011). Learning Web Development: Challenges at an Earlier Stage of Computing Education. Proceedings of the International Computing Education Research Conference (ICER). Providence, RI. pp.125-132. We're an interdisciplinary team with backgrounds in computer science, design, learning sciences, data analytics, and human-computer interaction. Of course we also share a deep interest in the web. Drexel University: Andrea Forte, Thomas Park, Michael Wagner, Brian Lee, Sukrit Chhabra, and previously Susan Wiedenbeck, Swathi Jagannath, Ankur Saxena. We're always looking to meet and collaborate with new people and organizations. If you're interested, please get in touch.